This level has medium difficulty. For this level try to play near to blockers and from bottom to shuffle candies. 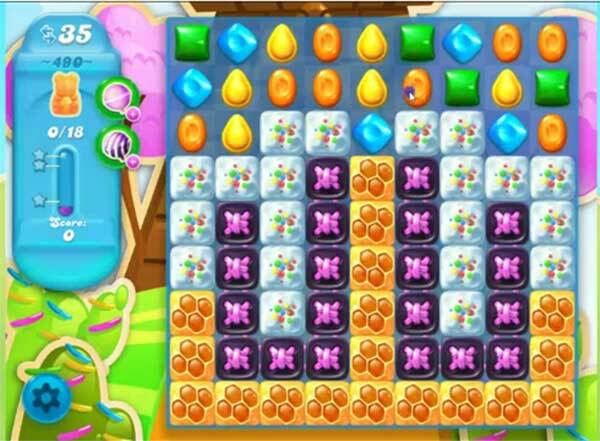 Try to make special candy as you get the chance and combine with each other to break the blockers. Play near to blockers and honey to save the bears. Try not to post videos that show you beating the level with extraordinary “special” things … the last 2 videos I looked at both had “special” situations — like this one had the color fat thing hooking up with a wrapped candy which gets rid of 3/4 of the screen! The last video had the color bomb plus the multi colored bomb which eliminates the entire screen. Just try to post an “average” video. Anyone can win with those combos, but it’s pure luck to get them. Thanks. How gets all those color bombs etc one after another.. what a crock. I only have 30 moves! Has anyone beat it with only 30 moves? I don’t see how it’s possible to beat this one. It doesn’t give any moves but wasted ones for the first 5 or so and then there’s no way to win. All those blocked tiles need 5 moves to break each one and there are tons of them. Rarely get any combos and even then they hardly do anything. Will see how it goes but this one is sure as hell not medium difficulty. 7 bears is the most I’ve gotten with three lock-outs or whatever you call it when you have to wait to play again. Level 490 is not possible with only 39 moves I have been trying for weeks and the most I have got is 15 bears, 35 would be tight but might keep people playing your game. Level 490 is not possible with only 30 moves I have been trying for weeks and the most I have got is 15 bears, 35 would be tight but might keep people playing your game. This is the second game I have come across that has short changed us (level 360 with only 30 instead of 35). You show how it is done with 35 – but only give us 30. I am getting very close with the decision of not playing any more. its there way of trying to drive revenue, make a level impossible to beat so that people have to buy there way through it. Yep that’s exactly what goes on with these games, generating money. If all games were easy to win nobody would pay. I’m at leve 490 and never paid a dime and never will.